Hmmm..tangerine. Never liked the fellow. Too indecisive, if you want to be an orange, be an orange. If you’re a peach, be a peach. This fence sitting fruit has no business being in a juice all by itself. 2 stars. I'm all for affirmative action in the mini orange world. Let the tangerine have equal footing with the mandarin orange! To be honest, this juice was very good, and tasted less "processed" than most. In addition, it was mainly pulp-free...pulp makes me gag. I'm not into the "meaty" orange juice. 4 stars for this taste sensation. A classic case of just because you can, doesn’t mean you should. 0 Stars for perverting nature. 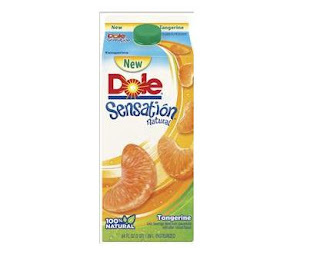 It doesn't matter what kind of dole juice I buy, it all tastes like a mix of banana and orange juice. The selling point of this juice is that's it's very healthy. Well if being loaded with sugar is healthy then I am a trainer on the biggest loser. Anyways, it's a decent drink but dole is still too acidic for my taste. 2 stars. Quick Hits average rating of 2-stars!